How appealing an actor is Sir Michael Caine? Put it this way: While watching him play Colonel Steiner in The Eagle Has Landed, a lot of otherwise sensible film goers find themselves rooting for the Nazis. In the classic 1971 Brit gangster film, Caine’s likability and magnetism are in full flower, as he somehow makes us care about and even identify with Jack Carter, a thoroughly nasty mob enforcer bent on revenge. In the dreamlike opening of the film, we learn that Carter works for some sleazy London crime lords who discourage him from investigating the death of his brother in Newcastle. Jack wasn’t close to his brother — indeed as the film progresses we find out he treated his brother horribly — yet something in Jack can’t accept his sibling’s mysterious death. He heads to Newcastle on his own, a very risky proposition given the rough criminals who run the city (led by John Osborne — yes THAT John Osborne, in a quirkily effective performance). But it’s no more risky than seducing and planning to run off with his boss’ girlfriend (A stunning and believable Britt Ekland), which Carter is also doing as he tries to determine how and why his brother died. Indeed, Carter seems drawn to danger: The more threats he receives to drop his investigation the more determined he becomes to pursue it to its conclusion. Carter also has to contend with an old rival named Eric (Ian Hendry). As a Newcastle criminal with “eyes like piss holes in the snow”, Hendry well portrays a mixture of fear and loathing of Carter, which is apparently what he felt for Caine. On the set, Hendry was sometimes drunk and openly bitter about Caine’s greater success as a star, and those emotions come out to advantage in the two men’s performances. The other star of this film is the City of Newcastle, which is dear to me both because I lived there and because I grew up near Pittsburgh, Pennsylvania at a time when it too was a struggling industrial city on the skids. Newcastle is bleak and tough, but also has character and spirit. 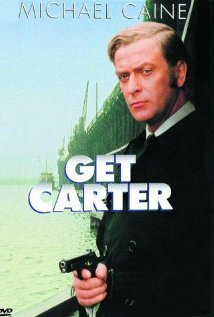 The feeling Geordies have for Get Carter is remarkable. A group of them even tried to stop the city from tearing down an old car park because it appeared in one of the movie’s many memorable confrontations between Carter and the gangsters of Newcastle. A young Mike Hodges came out of nowhere to brilliantly direct this gritty and involving film, one of only two great movies he made in his long and uneven career (the other is Croupier). Many directors would have overdone the violent scenes, but Hodges clearly understood that fewer and less graphic scenes actually have more impact, especially with a star like Michael Caine who can go from ice cold to pure savagery and back at the drop of a hat. It makes his character, and the film, fraught with electrifying menace. The clip I am posting is not strictly speaking a trailer. Rather, it’s the great Roy Budd playing his super-cool theme music, accompanied with scenes from the movie. If you have seen the film before, look fast for an important co-passenger on the train with Carter as he heads north. Love this film–it’s one Caine’s best. Never forget the early moment when caine clicks his fingers at the barman pulling a pint and says “Thin glass!”. He exudes menace. Previous Previous post: The jobs report: what should we do?